Fine Decorative Brass Sitting Buddha Available In Different Designs & Sizes. Unique artistic interpretation of Lord Buddha in a rare design, made of solid brass metal with colorful turquoise gemstone work. 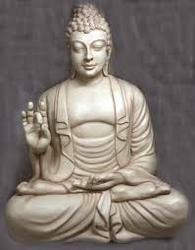 Handmade Buddha-in-palm statue in medium size. Buddha is symbolic of wisdom, calm and serenity. 7 Inch , Wire work , Pure Silver Metal (Purity - 99%) is used for Design work on this product & Body of Product is manufactured from the (Alloy of Zinc & copper). The Laughing Buddha is the ultimate symbol of joy and happiness. Laughing buddha carrying a bag represents fulfillment of wishes. It can be the blessing of buddha. Happiness is one of the laughing buddha\'s greatest gifts. Worshipped by devotees since ancient China, He is said to grant wishes and bring good tidings. Place laughing buddha facing the door. We present a wide collection of Brass Prayer Wheels that is as diverse as beautiful. Crafted using superior quality brass metals by skilled craftsmen, the quality of the Brass Prayer Wheels clearly reflects in their appearance. Designed in different patterns, these were originally used to bring peace and harmony by the Tibetan Monks and are now used universally. Being one of the renowned organizations in the industry, we are highly engaged in providing a premium quality range of Handmade Prayer Wheel. Made with intricate detailing, this timeless silver Buddha head ornament looks serene in both modern and classic interiors. Get this beautiful black Buddha Head along with 2 layers lucky bamboo plant in a glass vase from Ferns N Petals will create a feeling of the Far East in your surroundings. 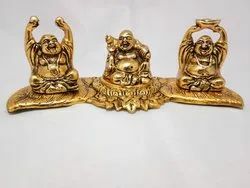 Laughing Buddha Introduction: Laughing Buddha is regarded as wealth renderer God. This brings..